How do you get children excited about the Word of God? 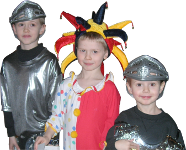 Bring Scripture to life for kids with easy costumes and props, and help them to find delight in the Word of God for a lifetime. There are so many wonderful stories in the Bible that will cause children to internalize the characters and therefore understand the Word of God with greater clarity. This workshop shows you exactly how to do simple hands-on learning activities for each section of the Bible, so that you can teach your children the entire Word of God with joy. This is not a physical product. When purchased, you will have permanent access to watch the video online. Why not bring the Scriptures to life for your children? Invest in your children's spiritual lives, and grab this great workshop today!